SPENCER, WI (OnFocus) At 3:21 p.m. on Tuesday, Marathon County Dispatch received a call for a tractor trailer fire on HWY 13 at S3000 south of Spencer. 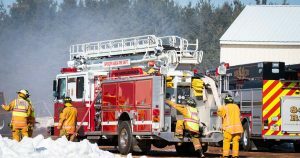 Spencer Fire Department responded to the scene with 3 apparatuses, including an engine, ladder truck and tender. Nearly a dozen firefighters were on-scene within 10 minutes of the call. The incident occurred nearly 4 miles from the station. There is no known cause to report at this time.